The Two Red Shoes opened on July 28th 1960. It was a new enterprise by Albert Bonici who was already promoting pop and beat events in Elgin’s Drill Hall. The Two Red Shoes started life as a jazz venue with dancing to the resident band, The Alex. Sutherland Sextet with vocalist Jean Lambe. Were it not for one event, this venue would have long been forgotten but on Thursday, 3rd January 1963 its place in rock history was made. Largely due to bad weather, this was the first day of The Beatles very first proper tour! The previous night’s show at the Longmore Hall, Keith had to be cancelled when the group’s van containing all their equipment went to meet them at Edinburgh and their plane from hamburg was diverted to Aberdeen. With heavy snow drifts across the highlands, there was no way the group or their van could make it to Keith. The tour was booked in November 1962 by Jack Fallon at the Cana Variety Agency and saw Albert paying the band £ 42 a night. Despite the low cost, he still lost money on the tour but a clause in his contract did offer Bonici an exclusive option on all future appearances in Scotland. While Bonici would appear to have made the “big time” through his dealings with Brian Epstein, his promotions at The Two Red Shoes seem to have been dogged by licensing problems. A look at adverts for the shows clearly states that most were promoted by clubs or societies. The Beatles were promoted by The Elgin Folk Music Club, The Findhorn Water Ski Club staged a show with Craig Douglas, The Lossiemouth Racing Pigeon Club put on Danny Williams and The Elgin Dance Club presented The Big Three. All these clubs staged regular events over the years at TTRS, along with The Elgin Ladies’ Hockey Club and The Moray Rugby Club. Anything with the name “Club” attached could be openly advertised but was classed as a private event with TTRS merely being hired for the occasion. This meant that Bonici was probably only licensed to stage one or two events a week. The other surprising thing is that he ran a very successful dancehall with no bar, a fact that led to a strong relationship with one of the local hotels where dancers would do their drinking before heading to the venue. At the start of the seventies, The Two Red Shoes became the Flamingo nightclub. Somehow, Albert Bonici was still having troubles with the licensing authorities. The Flamingo still had no liquor license. Is this the only nightclub since the days of prohibition to suffer this fate? The Two Red Shoes was known locally as the ‘tackety beets’ – boots with nails in the soles as worn by farmers. Everyone drank in the Tower before going to the dancing. The pubs shut at nine or 9:30 at that time in Scotland and yep the dance hall had no booze bar. Upstairs was coke a cola and juices — but you could buy cheap ‘blue liners’ — navy issue cigarettes from the sailors at RNAS Fulmar (Lossiemouth) The Red Shoes also featured many bands that made hits. ex. Dean Ford and the Gaylords aka The Marmalade etc. Great to haver been there at the time. I would need six months to recount the stories. Finding this historic account of The Two Red Shoes was a great surprise and brings back many fond memories. I was Alex Sutherlands bass player and joined the band just before the Two Red Shoes opened in 1960. We backed many of the solo artists touring the North East over the following years and kept the punters happy playing their favourite hits. The band played in the ballroom three nights a week but had other regular venues at Buckie and RNAS Lossiemouth. 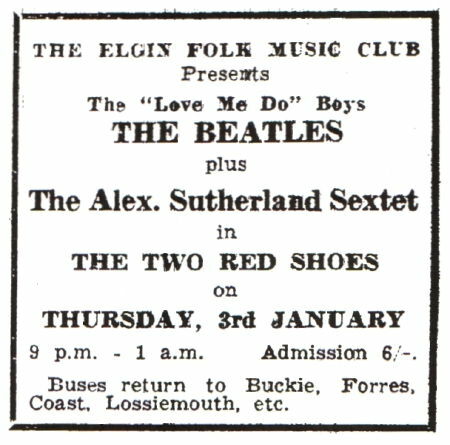 In October 1964,the band recorded ‘The Two Red Shoes Album’ at Grampian Studios in Aberdeen and it went on sale, mainly in the north of Scotland.In the autumn of 1965, Alex Sutherland left The Two Red Shoes to work in Aberdeen as musical director at Grampian TV. However,his original band continued to play at the Shoes over the next five years, led by Jimmy Martin and laterly by Graham Nairn. Those later years were just as good as the earlier years and helped retain the popularity of The Two Red Shoes.